Marking his decade of support for WaterAid, the Archbishop of York, Dr John Sentamu, inspires churches to support the charity’s Harvest Appeal. International development charity WaterAid, is launching its 2015 Harvest Appeal, aiming to raise £170k to transform communities around the world with access to safe, clean water, the chance to grow crops and a sustainable income. To get involved, churches can hold a harvest collection, or host a harvest supper to mark this special time of year. “For us here in the UK, it’s easy to take our water for granted; we use it to drink, to clean our teeth, to bathe, to cook, etc. Imagine if you had to do without water! WaterAid’s Harvest Appeal aims to raise money for mothers like Françoise, who lives in the Morarano community, Madagascar. She struggles to feed her children and is forced to give them water which makes them sick, from a filthy stream. Ernest Randriarimalala, of WaterAid Madagascar, explains: “If Françoise had safe water near her home, her children’s health would improve, and she’d be able to grow vegetables to feed her family. Plus she’d have some left over to sell, giving her a sustainable income. Just £215 could ensure a sustainable source of water for communities like Morarano. By holding a harvest supper or lunch and asking for a small donation from each guest, or by holding a harvest collection, congregations can make this incredible change a reality. 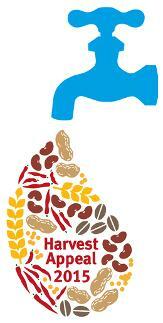 WaterAid’s FREE Harvest Pack provides a host of resources to help congregations with their harvest celebrations. From dedicated sermon notes and fundraising tips, to an inspiring film, posters, ready-made presentations, and a fantastic Sunday school activity booklet - there’s plenty to get everyone involved!